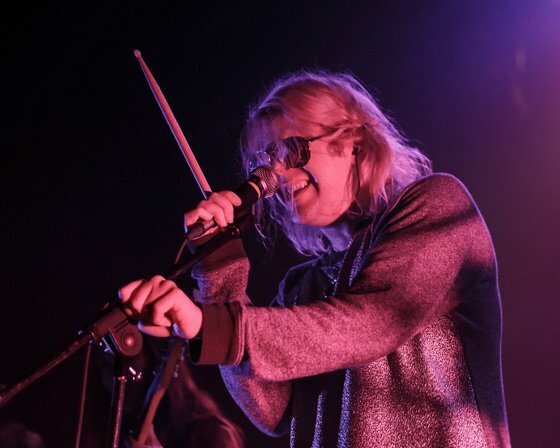 "My behavior onstage was gross and I can't defend it"
Earlier this week, Ariel Pink left concertgoers concerned due to his behaviour onstage in San Francisco, and he's taken to Twitter to address the situation. According to one attendee's Reddit account, the singer treated his girlfriend and bandmate Charlotte Ercoli inappropriately during their set. "He kept grabbing her like a piece of meat, grabbed her ankle and wouldn't let her go, attempting to push her into the crowd which she was clearly uncomfortable with, and the most offensive scene was when he literally pinned her down to the stage and got on top of her in a very assault-y fashion," the Redditor wrote. Ercoli has since responded to critics on Twitter, saying that she and Pink "were just having fun." She defended Pink's actions, claiming to be "victimized by feminists." Wow. Turns out a girl can't have fun with her boyfriend on stage without being victimized by feminists. Could not be more bummed. In a statement to Pitchfork, she added, "We are very close and can play around with each other in that way, but have tamed it down 'up there' in order to avoid stirring up fear." Now Pink himself has weighed in on the controversy, explaining that he "got very drunk and overdid everything." He also acknowledged that his behaviour was "tone deaf" and pledged to tone down his onstage antics going forward. Read his full string of tweets below. The artist is no stranger to controversy. Back in 2014, he claimed that he was working with Madonna — helping to reinstate a "return-to-values" so her producers wouldn't just "come up with a new techno jam for her to gyrate to and pretend that she's 20 years old." Grimes then stepped in, accusing Pink of "delusional misogyny" for his comments about Madonna. Pink responded by calling Grimes "stupid and retarded," adding that "maybe she's angry that I'm the male version of her, who was at 4AD before her." Pink is currently touring in support of this year's Dedicated to Bobby Jameson.